The Ebola virus is highly infectious and is transmitted in the human population via direct contact with bodily fluids of infected people and with contaminated surfaces (e.g. bedding, clothing). Recent research suggests, however, that a person's genetic makeup may play a major role in determining how an infected person's body reacts to the virus, ranging from suffering a lethal disease to complete resistance1. Dr. Nathalie MacDermott and her research team at Imperial College London are currently collaborating with the Institut national de la santé et de la recherche médicale (INSERM) and the Broad Institute to understand host genetic susceptibility to the Ebola virus. This initiative is the first genome wide association study (GWAS) in history focused on understanding filovirus hemorrhagic fevers. A genomic study which involves infected participants, and those in close contact with those infected, presents unique DNA sample collection challenges. 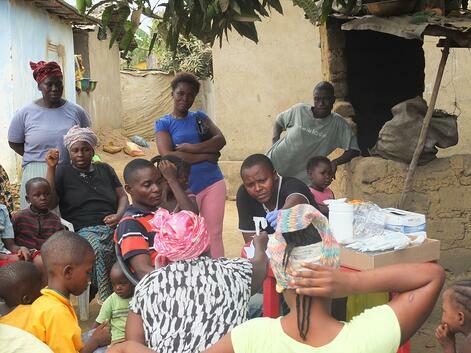 The Ebola outbreak left the affected population extremely apprehensive of needles as possible forms of contamination and infection, thus, a non-invasive collection method was necessary. Also, as collections had to take place in locations with inconsistent or no power supply, a method long term stabilization of DNA temperatures was crucial to study success. Dr. MacDermott chose DNA Genotek’s Oragene saliva collection kits for sampling from Sierra Leone, one of the countries most affected by the 2013 Ebola outbreak. She recently returned from West Africa where she collected over 2,500 DNA samples from persons living in various villages throughout Sierra Leone. Of these samples, 1,021 were from household contacts (persons who lived with someone sick with Ebola but were themselves not knowingly affected), 1,004 from community controls and 504 from survivors (no active infection). Most donors were able to provide a saliva sample independently, however, participants included children as young as 18 months and older adults in their eighties who required assistance. For this collection, Dr. MacDermott used DNA Genotek’s assisted collection kit which uses sponges designed to absorb saliva in the donor’s mouth. Dr. MacDermott stated the “community was comfortable with spitting; with no concerns or challenges”. Each Oragene/saliva sample was barcoded for individual tracking purposes. Following collection, the Oragene/saliva samples were transported by pickup truck at ambient temperature with no cold chain logistics (ranging from 30 minute to 4 hour trips) to the Infectious Disease Laboratory at the Un8iversity of Makenia for heat treatment (for inactivation of any possible virus) and then air transported to Imperial College London for automated DNA extraction on the Qiagen QIAsymphony. During this transport, the samples remained in the Oragene collection tubes which are designed to withstand air pressure and temperature fluctuations. Dr. MacDermott confirmed all samples have now been received in London with no leakages or lost samples reported. The 2,500+ DNA samples collected and transported from Sierra Leone, along with another 500 samples collected from persons deceased from the Ebola virus, may be analyzed using Illumina’s H3Africa genome-wide association (GWAS) array or another similar array to identify potential causative gene variants for Ebola disease susceptibility. Dr. MacDermott is open to further collaborations in this field of research - to get involved, please contact us at info@dnagenotek.com. We look forward to supporting Dr. MacDermott through this research project and hearing the results of their discoveries on the genetic correlation of Ebola viral disease resistance. If you would like to try Oragene for your own DNA sample collection, click on the button below to request complimentary trial kits.